The track, “Alive,” sums up so much about “Treasure.” It’s a high energy, life is good, praising God sort of album. The soundtrack takes you all over the globe with some dance tracks, hip-hop, and a bit of Latin spice as well. Songs like “Everybody’s Dancing” are truly infectious and the message is perfectly clear as well. Take “Shine Bright” for an example, its dance beats and edifying message of being a bright star, filed with God’s goodness and grace, is very uplifting. An excellent combination. My favorite tracks though are definitely the ones where the Latin influence is much more prevalent. That would be, “Estoy Bien,” and “Que Todo Mundo Sepa.” Admittedly, I failed miserably at Spanish in college, but that does not mean I cannot have an appreciation for the language. The songs are just so good that I may actually learn a bit of Spanish from them. 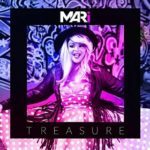 The title track, “Treasure,” is more emotive and much more subdued musically, but MARi’s tender vocals are touching. It is also a very personal testimonial song that touches your heart. Similar is “I Believe in Jesus,” another touching melody. Another slower song, and my personal favorite, is “I Believe in Jesus.” You’ve no doubt heard similar lyrics, but the intensity of which MARi sings this song is truly moving. I think you’ll be blown away by the creativity of “Hear My Roar.” It’s a good concluding song that exemplifies her bold approach to her music. I really love the diversity of this album and I think it is well worth checking out. For starters, check out http://mariburelle.com/mari/. This entry was posted on Wednesday, June 22nd, 2016 at 8:31 pm and is filed under CD Reviews . You can follow any responses to this entry through the RSS 2.0 feed. Both comments and pings are currently closed.